PBOT crews grind away damaged asphalt on West Burnside on Tuesday, March 21, 2017. 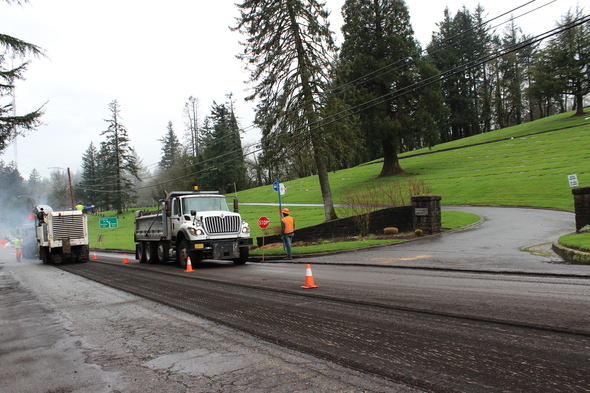 On Thursday, March 23, crews will repave approximately 2 lane miles from 6 a.m. to 6 p.m. Photo by Hannah Schafer, Portland Bureau of Transportation. NW Skyline will be closed between West Burnside and NW Cornell on Thursday, March 23, from 6 a.m. to 6 p.m.
(Wednesday, March 22, 2017) – The Portland Bureau of Transportation advises the traveling public that NW Skyline will be closed between West Burnside Road and NW Cornell Road on Thursday, March 23, from 6 a.m. to 6 p.m. to ensure work zone safety while PBOT crews repave approximately 2 lane miles on West Burnside Road. Local traffic will be able to access NW Skyline Boulevard from the north via NW Cornell Road. The largest landslide to affect a Portland street this winter occurred on West Burnside between NW Skyline Boulevard and SW Barnes Road at about 7 a.m. Wednesday, March 15. The road has been closed since then. West Burnside is closed to people biking, walking or driving between NW Skyline Blvd and SW Barnes Road, near the Mount Calvary Cemetery. People driving through the area are encouraged to use U.S. 26 or NW Cornell Road as alternate routes, or consider public transit. A signed detour will guide westbound traffic to use SW Skyline Blvd to Barnes Road, then to West Burnside. Eastbound traffic will be directed to SW Barnes, then SW Skyline before returning to West Burnside. We ask travelers to observe all street closures and directions by reader boards and flaggers, and use alternate routes if possible. This work is weather dependent and the schedule is subject to change.